Cold-shoulder prom dresses are trending for prom 2019. A soft, wide ruffle encircles the v-neckline of this blush pink formal dress with thin shoulder straps that create a dreamy look. The feminine off-the-shoulder ruffle continues to the deep v-back of this lovely prom dress from the designers at Bari Jay. Layers of soft chiffon on the a-line skirt flare away from the hips for a shapely silhouette on this elegant long formal dress. 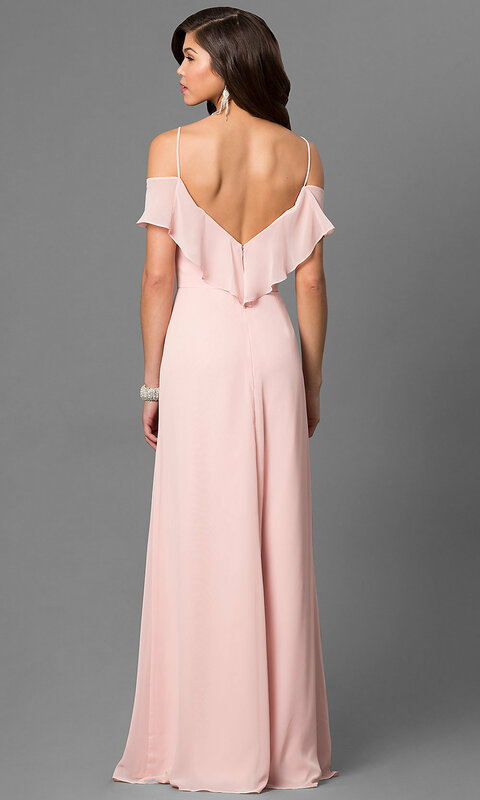 For prom or wedding receptions, this blush pink long prom dress combines classic cold shoulders with softly feminine ruffles for a one-of-a-kind style that you will love.